Evidence of the exchange of books as gifts between scholars is to be found in several volumes in St John's associated with Roger Ascham. 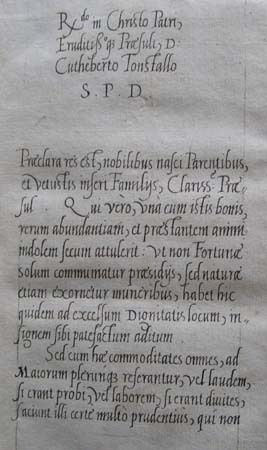 These comprise four volumes given by Ascham, each bearing a dedicatory epistle of several pages in his fine handwriting, as well as one given to him. The volumes he gave were destined for three recipients. Two were given in 1554 to Cuthbert Tunstall (1474-1559), initially envoy to the Duke of Burgundy, and later Bishop of Durham, who survived the reigns and changing religious alliegances of four Tudor monarchs. 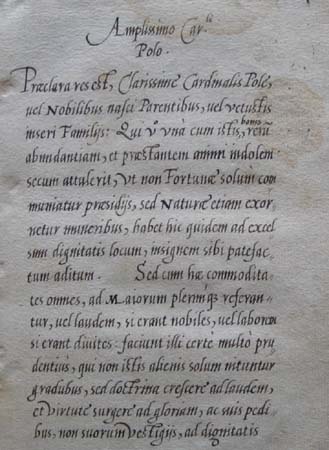 A year later Ascham gave another copy of one of these texts, Jeronimo Osorio's De nobilitate civili, to Cardinal Reginald Pole (1500-1558), who at that time was involved in the removal and trial of the protestant Archbishop Cranmer following the accession of Mary, and who took over the vacant seat later that year. 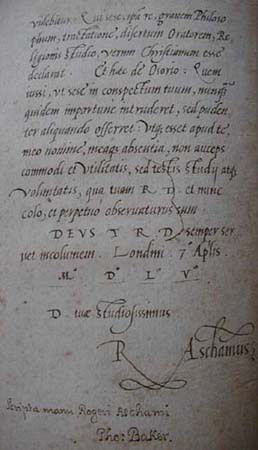 In 1566 a copy of Carlo Sigonio's De republica Atheniensium was given to Bartholomew Dodington (1535/6-1595), a noted Greek scholar, who like Ascham also attended St John's. 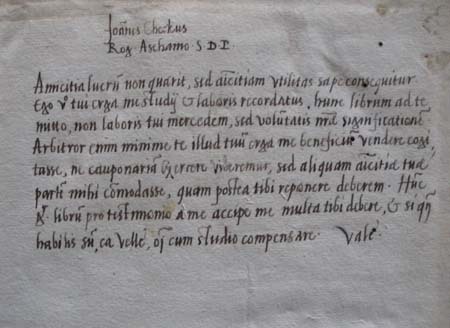 The Library also possesses a copy of Hesychius's Greek dictionary (1521) bearing an undated inscription to Ascham by the humanist scholar and royal tutor, Sir John Cheke (1514-1557). Ascham distinguished himself in classics at St John's and became a fellow in 1534, Tutor to Princess Elizabeth in 1548, Latin Secretary to Queen Mary in 1553 (in which position he was specially permitted to continue in his profession of Protestantism), and Private Tutor to Queen Elizabeth in 1558. The beauty of his handwriting brought him employment as the writer of official letters on behalf of Cambridge University. In 1545 he published Toxophilus, a treatise on archery, in which he had considerable skill. Toxophilus is still honoured by archers as the seminal treatise on their sport, and by literary historians as the most successful of early attempts to write a formal prose discourse in English. Ascham's Scholemaster, one of the most influential of Tudor treatises on education, was published posthumously in 1570.